Our RPG card game Shadowhand is set in the late 18th century, around 1770. 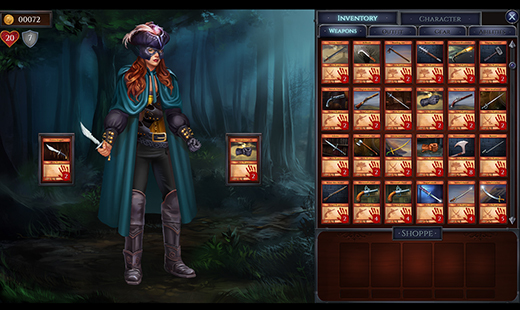 Our heroine, Lady Cornelia Darkmoor, spends much of her time in disguise as the eponymous highway woman, Shadowhand. Outfit items work along similar lines to “armour” in many RPG games, and so changing your garb has a significant effect on gameplay. The riding habit Shadowhand is wearing is inspired by this one, held at the V&A museum in London. Made from woven wool, with a silk lining and a heavy metal braid, the style is definitely Rococo. 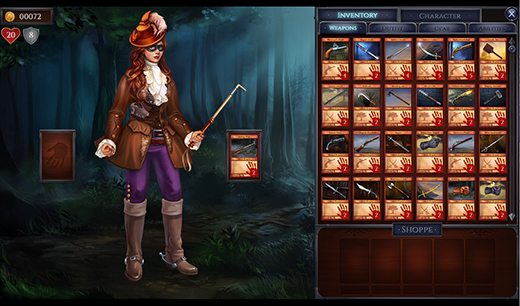 Shadowhand’s riding jacket boasts 1 defence, with an additional defense bonus if worn with the riding boots, as she is here. It also gives you big pockets – you get an additional gear slot for bombs and potions, boosting the number available from three to four. She also has a riding whip that she won in a duel with an angry aristocrat seeking vengeance for an earlier robbery. It’s a nasty weapon with a chance to cause bleeding, and does even more damage if you equip it as part of the riding set, with the riding jackets and boots. Tally ho! Some of us spent a lot of time pretending to be superheroes when we were kids – some of us maybe never stopped. If so then this outfit ticks many of the right boxes. Every superhero/ine needs a great cape. This cloak has the ability to withstand animal attacks and comes highly recommended by the local hound master. In addition to dog bites, if also repels rats and leeches. Yes this game does involve getting attacked with rats and leaches – these are practically household items: it is 1770. If she gets his mask it increases both her stealth, and her chance of going first in duels. Finally, the brutal glove. These are pretty lethal, with a chance to cause bleeding and to stun. Wearing a pair makes them recharge between strikes even faster. Some people like to go for something classic and understated. Shadowhand can certainly don appropriate work attire for night-time heists if that’s your preference. Her black coat boosts defense specifically against “land” weapons. 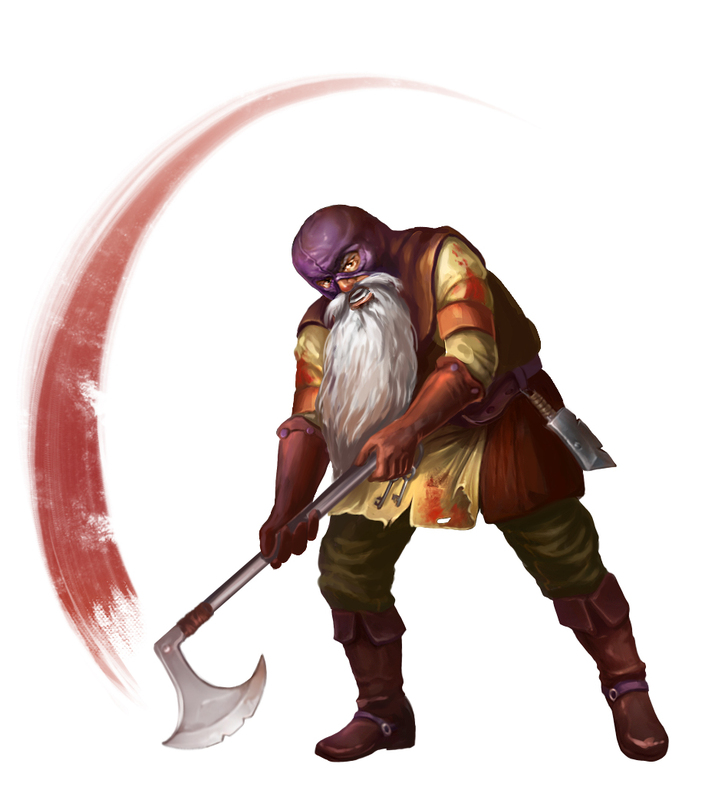 We’ll be delving into the weapon classes in more detail in a vlog soon, so watch out for that. The lovely feathered tricorn is great for deflecting thrown items. There will be plenty of these coming at you – in addition to the aforementioned rats and leeches you should be ready for bombardment with flaming grog bombs, throwing knives, snuff, wig powder and a range of other bombs. So this hat could be viewed as the essential hard safety hat for dangerous highway work. Shadowhand’s sea service pistol is standard Royal Navy issue, and teams perfectly with the ornate gilt smallsword for roadside intimidation. Ornate smallswords were often worn by men in the 17th and 18th centuries as a status symbol, and were the forerunners of duelling swords. Her gun is a “sea” weapon and her brown gun belt is well suited to swashbucklers, giving a damage boost to “sea” class guns. As well as being a stylish accessory, Shadowhand’s freebooter kerchief not only shields her face but also adds to her ‘luck’ stat, which can be found in her character sheet. Luck helps you to find more gear (bombs and potions) in loot. 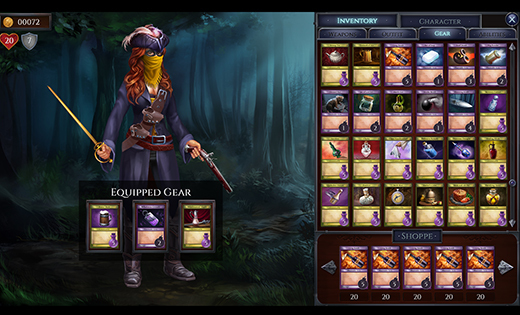 There are over 13 million unique combinations of clothing that you can pick for Shadowhand, so there’s bound to be something there to suit your playing style and strategy. You can mouse over your own load out and your enemy’s pre-duel, and you may choose to alter your outfit to ensure you are optimised for the very different enemies you will encounter. What’s your favourite outfit in the post above, and why? This entry was posted on Saturday, September 3rd, 2016 at 4:17 pm and is filed under Developer Diary, Grey Alien Games. You can follow any responses to this entry through the RSS 2.0 feed. Both comments and pings are currently closed.